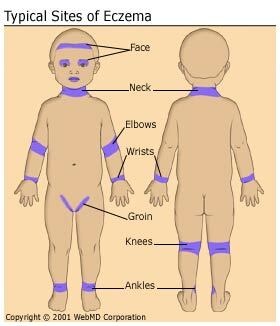 Eczema is a chronic, superficial inflammation of the skin, which is associated with redness and severe itching. The cause of eczema is unknown; however, genetics appear to play a role in the transmission of eczema from one generation to the next. Approximately 5% of the U.S. population is affected by eczema. It is often associated with a personal or family history of hay fever or asthma. 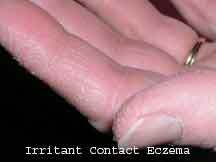 Treatment for eczema includes topical steroids and antihistamines to reduce inflammation and itching. A mild skin care routine using a soap-less cleanser such as Cetaphil cleanser and moisturizing lotions is helpful in reducing dry skin conditions. Avoid perfumed soaps, harsh laundry detergents and fabric softeners. On occasions, more aggressive therapy is required which might include oral steroids and/or antibiotics. A new class of "immunomodulators" are now available to treat eczema; these topical drugs are steroid-free and useful in selected individuals. Elidel is the number one prescribed brand for eczema. Treating mild or moderate eczema with Elidel offers several benefits. Does not cause certain side effects, such as thinning of the skin, stretch marks, skin discoloration, or spider veins. Can be used for repeated courses of treatment as directed by your doctor.